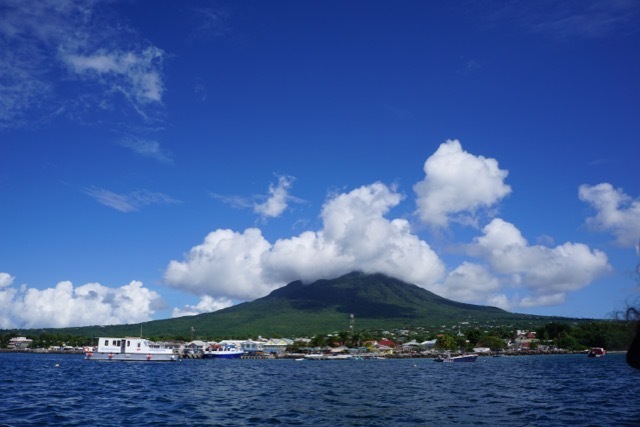 We have safely arrived in Bonaire after a glorious 3 day sail from the Island of Nevis. 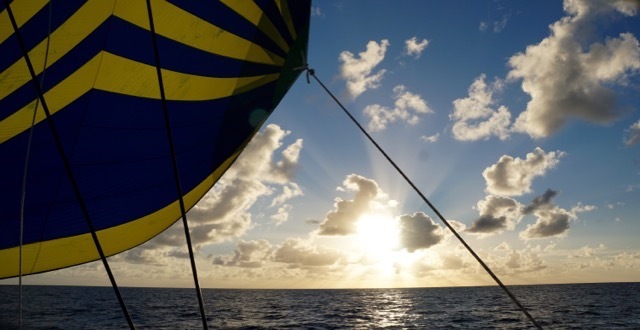 We pulled up anchor around ten in the morning in light winds, and raised the spinnaker. 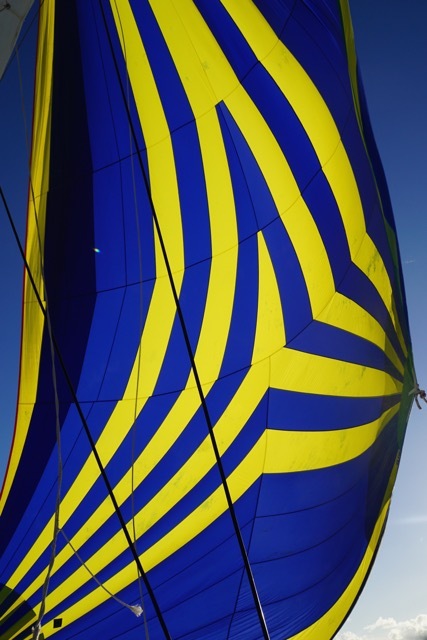 We love sailing with the huge blue and gold spinnaker. 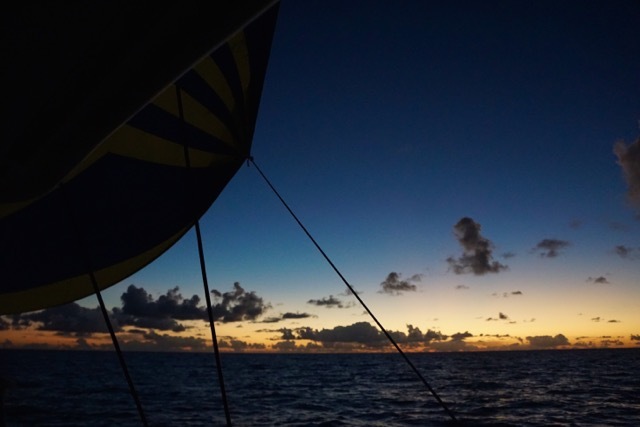 On our first day we sailed 125 nautical miles. 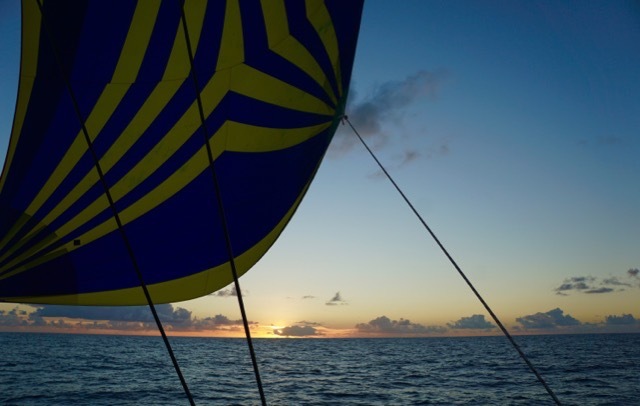 The winds were really light, but since the spinnaker is made of a much lighter fabric than our mainsail and jib, it responds so well to light airs. 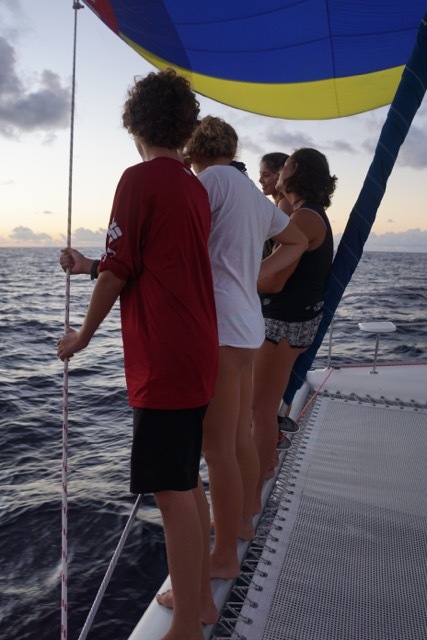 During the day we read, chatted, played games, manned the boat and as the sun was setting, we arranged the watch schedule. Danny would take 10pm to midnight, Mycah and Aidan from midnight to 2am, Jude and Emma from 2am to 4am and yours truly from 4am to sometime later in the morning. While on watch I love to listen to audiobooks. Sometimes I meditate, pray, think and plan, and always without doubt I think about my Dad and brother who recently passed away. The stars are always so bright and plentiful, and it humbles me. I am grateful for these times. 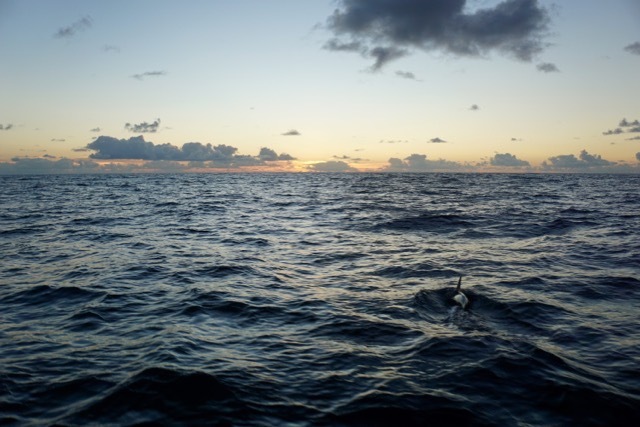 The wind picked up on our second night, creating huge swells which raised up about 9 ft then rolled down in powerful mounds of intense energy. Tanda Malaika would surf down then rise up the next only to surf down once again. None of us slept very well the second night, and at one point around 1am we were all up at the helm chatting and enjoying each others company. I worked out provisioning lists, the creatures worked on school work, Jude fixed some caulking areas, and Danny downloaded more weather updates through satellite on his computer. Then, close to sunset, Jude called out that dolphins were bow riding. 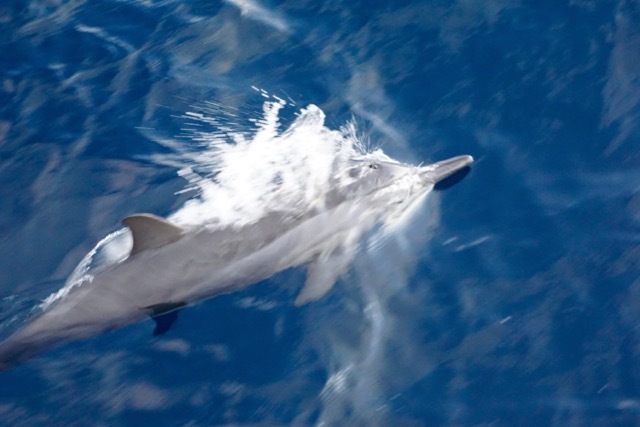 We all made our way to the bow to see a huge spinner dolphin pod playing around the hulls and bow. 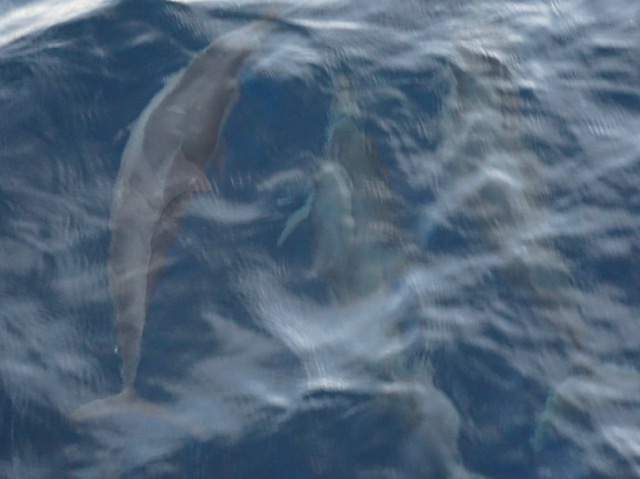 They rose up for air then dove just below the surface, racing along with us. We’ve had this experience so many times and we never grow tired of it. Such beautiful creatures. They stayed for about 20 minutes, then disappeared into the deep just as the sun set. 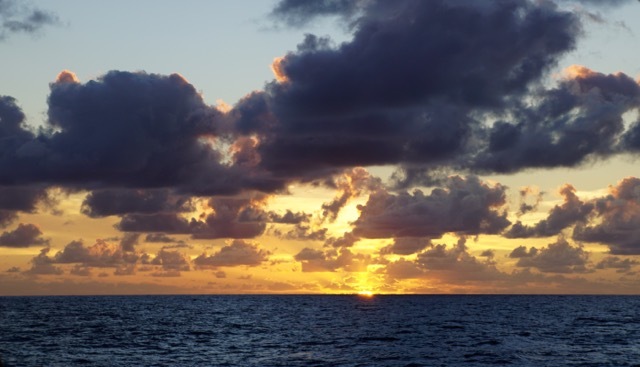 A beautiful ending to yet another beautiful day on the water. 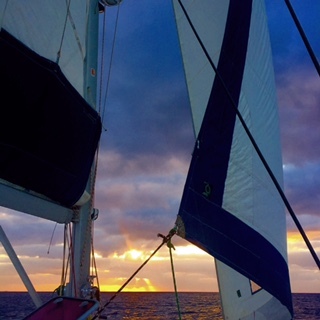 On our final day with heavier winds, we covered 185 nautical miles, arriving in Bonaire at about 4pm. We are grateful to be here safely, and don’t take it for granted. Our anchorage is as calm as a lake, the reef below us is absolutely gorgeous, and rather than barracuda, we now have large tarpon under our boat. Tonight we will definitely all rest well.